AllegroMedical.com presents The McKesson® Offset Handle Steel Cane. 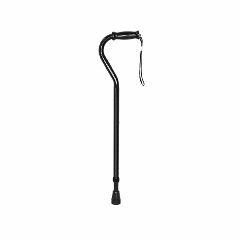 Standard-styled cane for enhanced maneuverability allowing use in narrow spaces such as staircases. Offset handle desiged to effectively aid walking by better distributing weight over the cane. Manufactured with heavy-duty steel tubing to support users up to 500 lbs. Ergonomically-designed offset handle with vinyl contoured grip and wrist strap to reduce hand pressure allowing for increased stability and comfort and convenience. Height can be easily adjusted in 1" increments from 29.75" - 37.75" with a single push button. This device intended for medical purposes that is used to provide minimal weight support while walking. Not made with natural rubber latex.